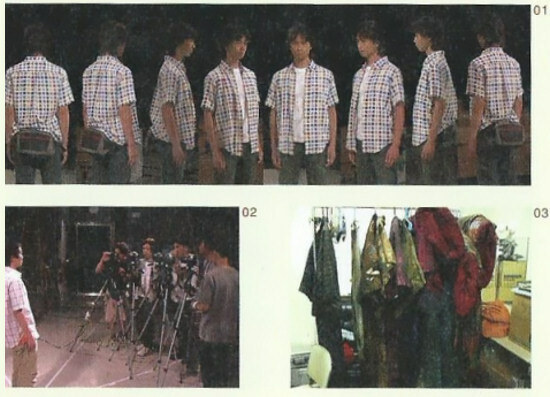 The basics are standing the actor, actually in costume, surrounded by cameras from eight directions. The photographic data obtained this way is pasted onto a blank 3D model based on the actor's proportions, creating the character. The facial expressions are captured separately from the full-body textures, allowing them to carefully sample their movements and create a multitude of expressions, such as being twisted with fear or smiling. In any case, despite being a video game Siren 2's development was a large-scale process, involving auditions, rehearsals and shooting. Just like when filming a movie or TV show, they also required a vast array of costumes and props. To be frank, this kind of method takes a long time. In a sense it frees them from the video game merit of being able to create everything (using computer programmes) from zero, but there's a reason why the staff are so insistent upon this method: they assertively try to include into the game the unexpected effects created by feeding the movements and expressions of professional actors to a CG model. Also, having the performance done by a real human being can sometimes give personality to the characters that even the developers hadn't thought of, so occasionally there were changes required to be made to finer parts of the story to go along with it. Perhaps the characters of Siren 2 are the first to be given flesh and blood by collaboration between the actors playing them and the development staff.